It's been a busy couple of months for me. Still cleaning here and there - the flood cleanup unearthed the REST of the stuff in the basement, so I've been chipping away at some of that. And I've gotten to do some concerts this summer. Went on June 30 to see Renaissance and Steve Hackett in Milwaukee - FANTASTIC show! Here's the happy group that went . . . all folks that I've met on these sites! 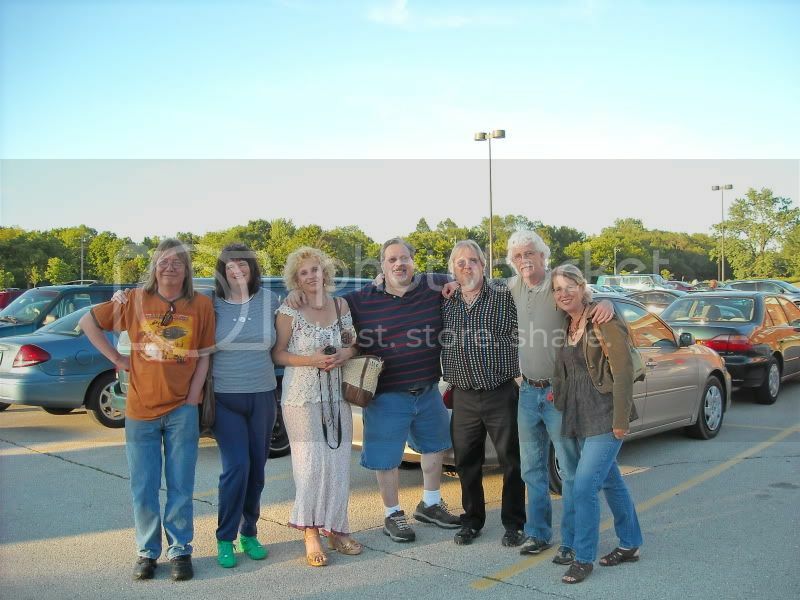 Then July 17 we drove up to Detroit to see Dream Theater/Iron Maiden! It was a weekend drive up and back without stopping - exhausted afterwards but SO very glad I went! This past weekend I went to see Yes-friends Will and Anita in Memphis, and we went to a pub to listen to Will's band, The Vynals - they do a terrific set of 60's music! Check them out on THIS site! Just bought tix today to see CSN/Tom Petty here in Nashville on August 12, and I already had tix to see Porcupine Tree/Coheed & Cambria on August 22! And I'm looking to squeeze in another Chicago trip between the two to see Jon Anderson on the 19th! So much music . . . just wish I had MORE money so I could see ALL the shows! wow, this Yestalk site. I remember spending have this decade on it. I think I got banned twiceDSCI0526..jpg Beside that unmanned lifeguard station is where I hung out today, worked on my tan , went for a dip and a shorebreak bodysurf. Water 5 degrees cooler than normal...got an apartment above this beach. Played Mood for a Day at an open mic this summer- ony the over 40's in the audience recognized it. Didn't see Yess when they played at Verizon this summer or spring. Rather see Anderson. I never knew you had a breakdown service called the AAA. Ours is just AA, so it often gets confused with Alcoholics Anonymous. AAA stands for American Automobile Association. For a yearly fee, they'll come tow you if you need it, break into your car for you if you lock your keys in, stuff like that. They also offer trip information - you can call them when you're planning a trip, and they'll tell you about special deals, give you maps and stuff. Friday afternoon here at work after a LONG week with lots of problems that folks are fussing at us about . . .
Meeting a Yes-friend at dinner who's coming through town, so I'm waiting on his call . . .